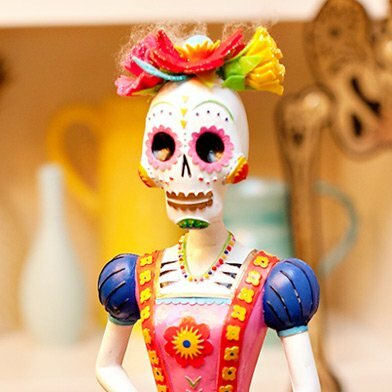 Abigail of Paper & Cake doesn’t think kids should be the only ones having fun on Halloween and we agree! 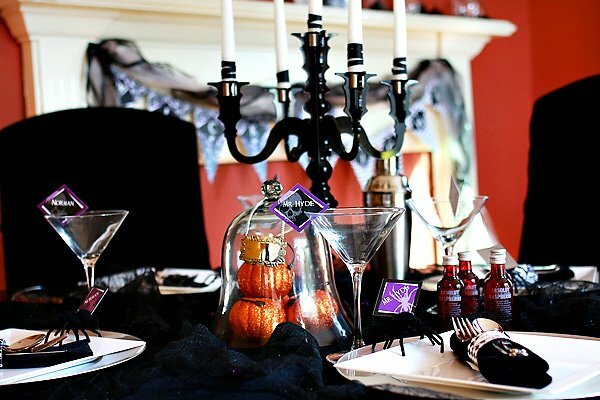 She styled and designed a spooky, yet sophisticated adult dinner party starring her new Wicked Hallow’s Eve printable collection and went for a deadly color combination of black and white with splashes of purple throughout. 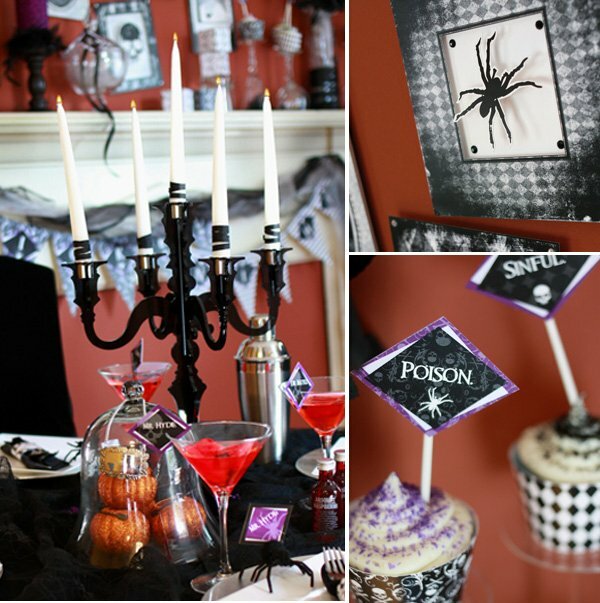 The creative use of everyday items such as wine glasses an apothecary jars is SPOOKTACULAR here! For example: turning wine glasses upside down makes the perfect cupcake pedestal. Who knew?! 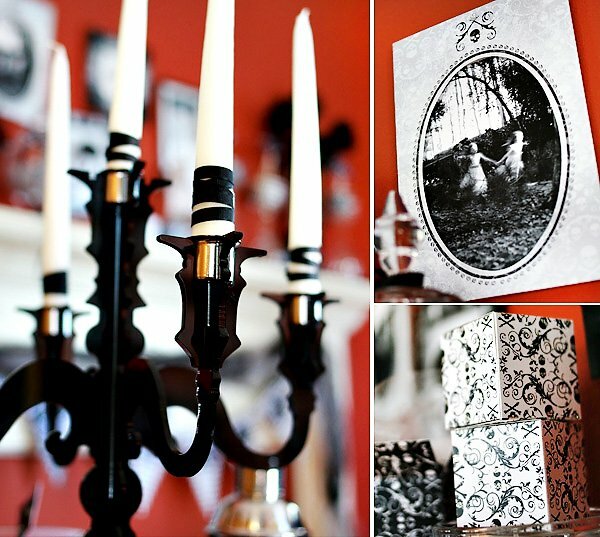 And mini “viles” of Absolute Vodka displayed in apothecary jars makes for both functional & decorative decor. 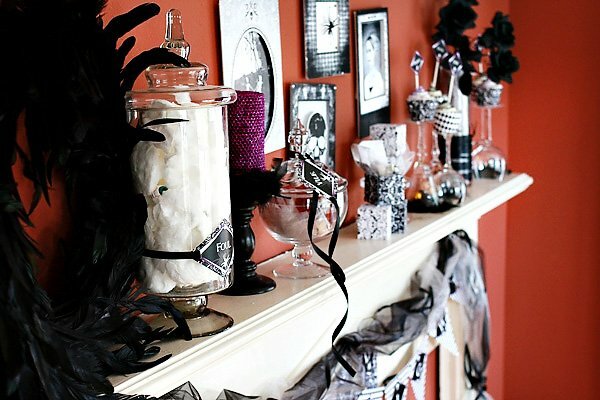 The eerie off-kilter ghostly photos above the mantel take center stage at this party, while an alluring black candelabra serves as the perfect elegant table centerpiece. It’s also refreshing that she didn’t go overboard with the sweets, but snuck them in as decorative edible additions. 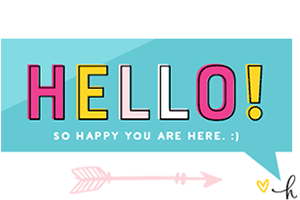 PARTY DETAILS, as told by Abigail. 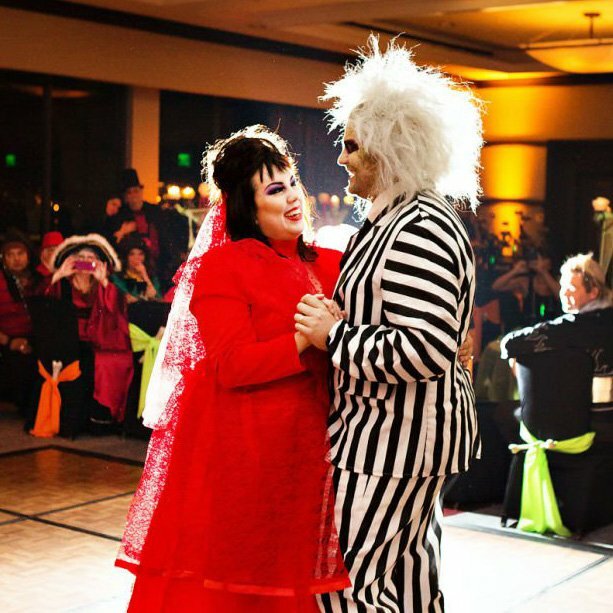 . .
Why should kids have all the Halloween fun? 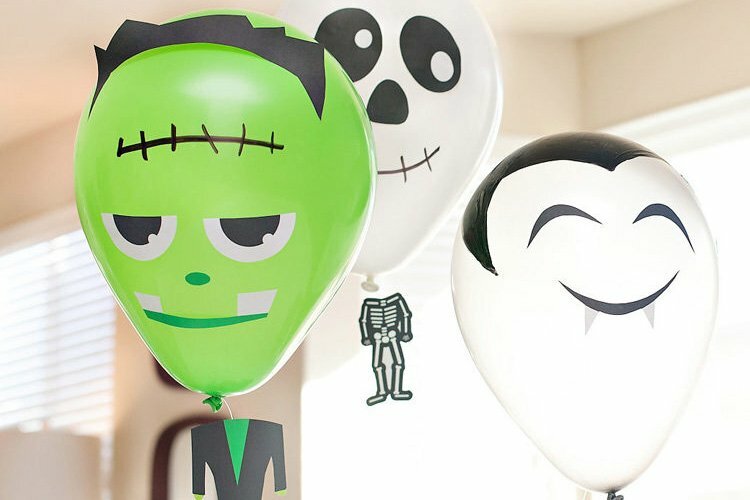 If you love to throw a spooktacular dinner party, while wearing a wicked costume, then this is the perfect decor for you. 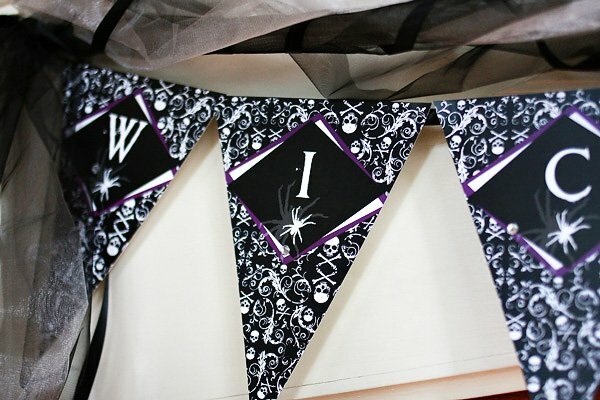 This deadly black and white printable party has just a touch of purple in its eerily sophisticated skull and crossbones design. 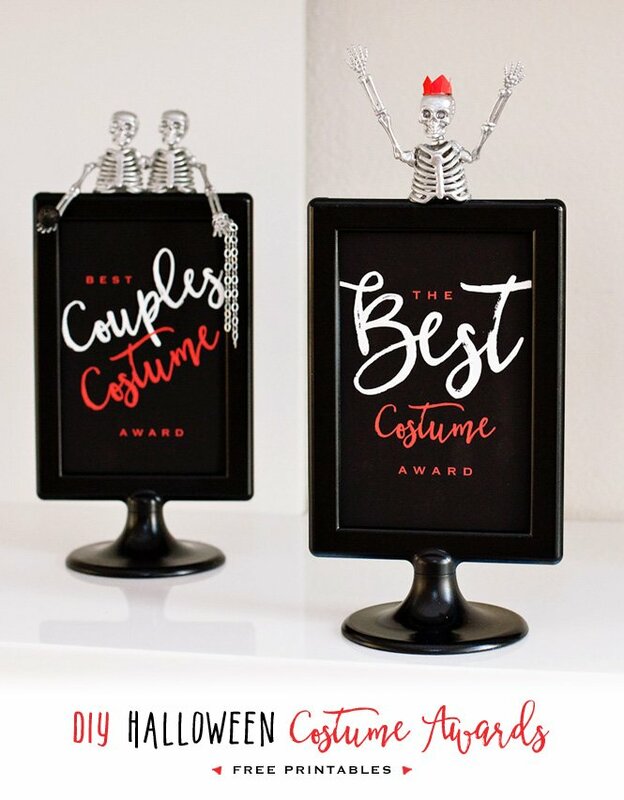 An adult beverage station can be put together using any of your favorite drinks, just give them a Foul name, and label them with printable table tents. 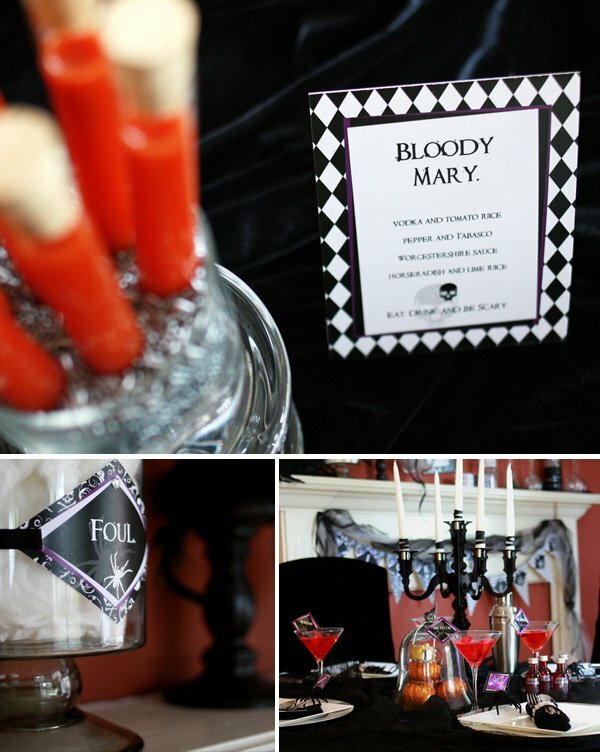 Our Bloody Mary shots were served in test tubes, and the Black Martinis in an eclectic array of borrowed glasses. Desserts can often be a tough sell to adults watching their calories, but a few well placed yummy treats can be snuck in to entice them. Cupcakes placed on upturned wine glasses look absolutely irresistible, and an enormous apothecary jar filled with sour apple cotton candy will be tempting as well. 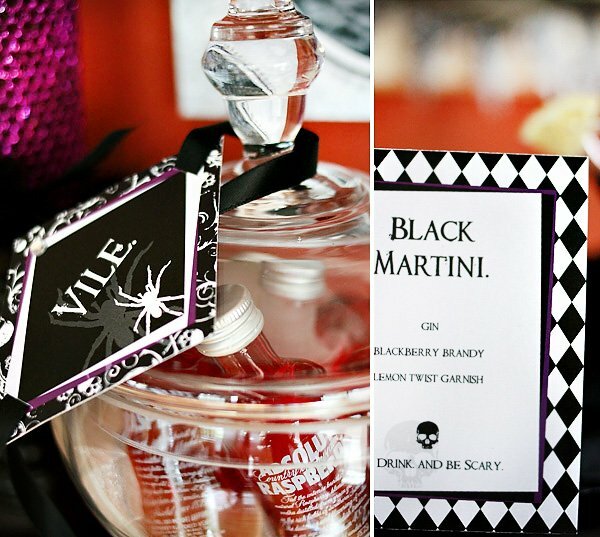 For the non-sweet tooth, allure them with mini-bar size alcohol bottles to make their own fancy cocktails. The absolute master piece of this party, can be seen hanging on the wall above the upcycled mantlepiece. Trompe L’oeil Paper Frames showcase Spooky Portraits of ghost like children in the forest, and an unnatural looking vampire victim. 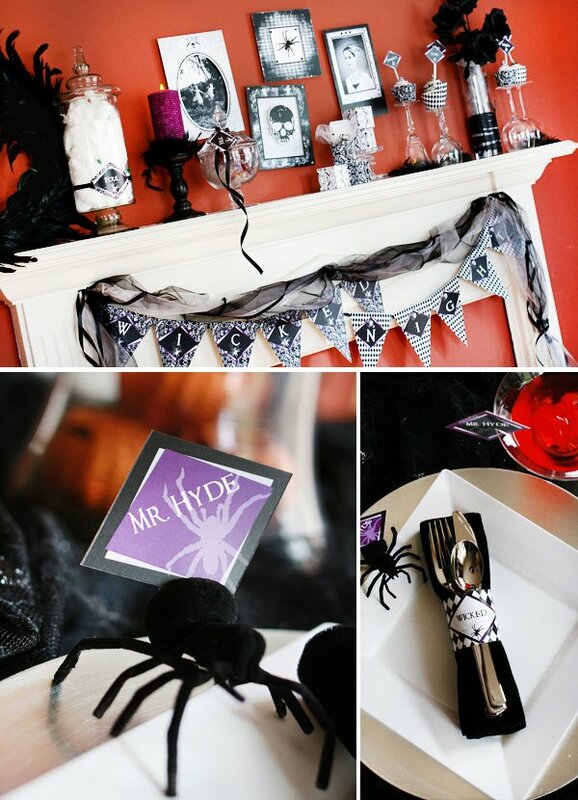 Showcased in additional paper frames are a poisonous spider and an eerie skull made to look 3D with a simple backing of foam core. 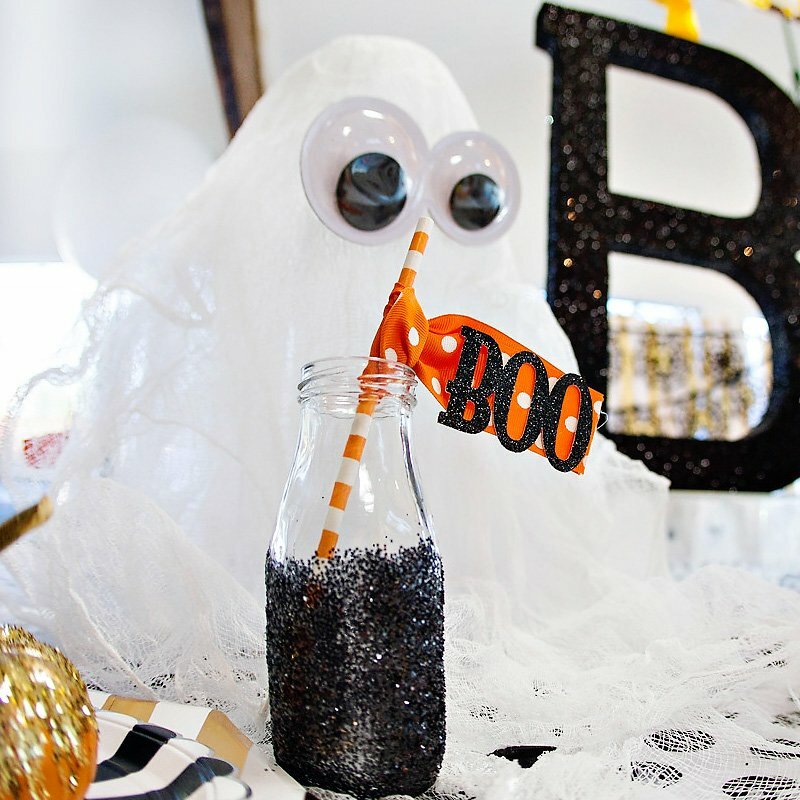 Particularly love the glitter mini-pumpkins…it all looks so great I want to be part of this paty! Fantastic party! I love it. 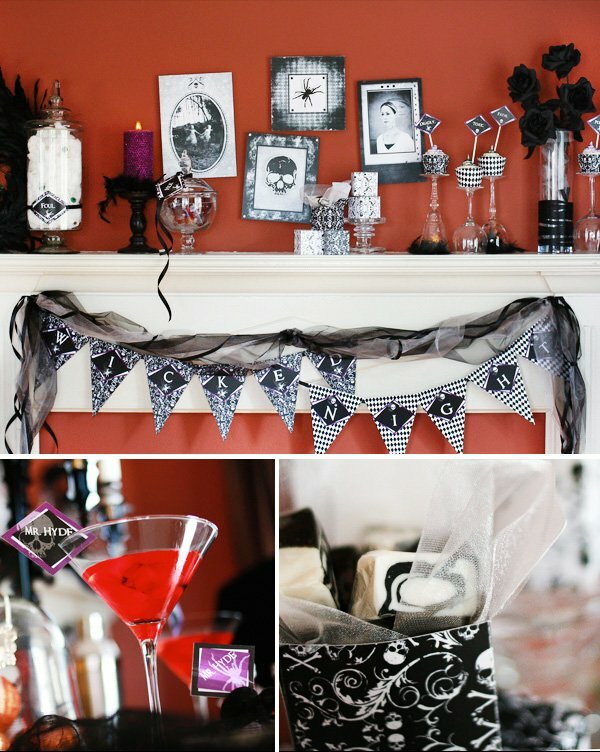 I want to use all these ideas for decorating and the food/drinks and I don’t even do the Halloween party thing!